Made for Abbot William Dalton of Furness Abbey, Lancashire, the cartulary collects all the documents, such as deeds, papal bulls , charters, and grants, pertaining to the monastery. The result is called the 'Coucher' or 'Cowcher'. It probably was made at Furness Abbey itself, in a period when large manuscripts were often produced in urban workshops. Furness was a Cistercian monastery and was remote because of the order's ideal of isolation. The provincial surroundings, however, did not deter the ambitious project. The documents in the coucher are arranged by location and by type of donor: royal, lay, papal, episcopal, etc. 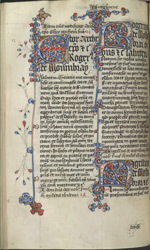 This page presents donations of Roger and Nigel de Mowbray.